As a financial professional, you should explore and use multiple strategies to fill your lead funnel. To become a successful insurance producer, you must first develop a long-term marketing plan and most importantly, commit financial resources to see that plan through. This book shows you the five most effective and proven ways to fill your sales funnel. If you want to experience growth and success, you need to consider implementing multiple marketing and prospecting initiatives. Additionally you need to continually calculate the Cost per Lead (CPL) and Return on Investment (ROI) to ensure the marketing program is generating the results that make the most financial sense. 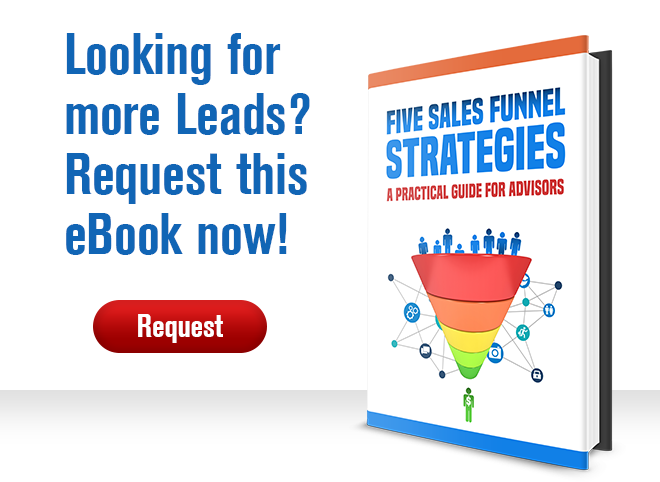 This eBook will provide you with some (not all) of the ways you can fill your lead funnel and allow you to experience lead and sales growth.